Identification: Page and Burr (1991); Jenkins and Burkhead (1994); Mettee et al. (1996). Another commonly used name is Ictalurus brunneus. Native Range: Atlantic Slope from the Pee Dee River drainage, southern Virginia, south to Altamaha River drainage, Georgia, and middle St. Johns River drainage, Florida; Gulf Slope in Apalachicola River basin, Georgia, Alabama, and Florida (Page and Burr 1991). Table 1. States with nonindigenous occurrences, the earliest and latest observations in each state, and the tally and names of HUCs with observations†. Names and dates are hyperlinked to their relevant specimen records. The list of references for all nonindigenous occurrences of Ameiurus brunneus are found here. 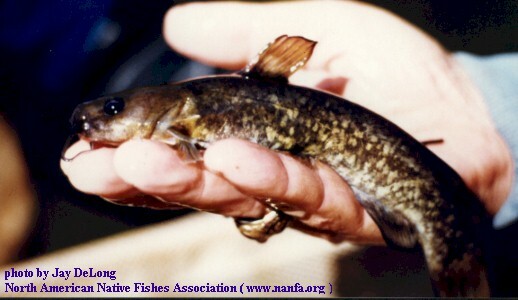 Means of Introduction: Introduction of Snail Bullheads may have resulted from stock contamination of black bullheads (Ameiurus melas) that were stocked in Belews Lake, North Carolina, on the upper Dan River (Burkhead et al. 1980). Unknown means in Georgia. Status: Established in Georgia, North Carolina, and Virginia. Remarks: Burkhead et al. (1980) provided a map and a discussion of this species' distribution in Virginia. The appearance of this species in the headwaters of the Coosa River system in northern Georgia was likely a result of natural stream capture (Bryant et al. 1979; Lee et al. 1980 et seq.). Etnier, D. - University of Tennessee, Knoxville, TN. Jenkins, R. E. - Roanoke College, Roanoke, VA.
Mettee, M. F., P. E. O'Neil, and J. M. Pierson. 1996. Fishes of Alabama and the Mobile Basin. Oxmoor House, Inc. Birmingham, AL. 820 pp.